Iloilo City– Various churches, organizations, and peace advocates, commemorated the #EDSA33 in Sunburst Park, Downtown, Iloilo City. This gathering is part of the ecumenical response under the banner of One Faith, One Nation, One Voice, calling for truth, justice and peace. With the theme “Tayo and EDSA, Tayo ang Pag-asa! Labanan ang Diktadura!” this gathering remembers the collective action of the people, toppling a tyrant-dictator, under President Ferdinand Marcos, 33 years ago. This gathering also speaks about the hurdles of our time, and the rise of tyranny under the current dispensation. Interfaith prayers for justice and peace were offered, as solidarity messages from different organizations were heard in support of the toiling masses, exposing the real and punctuated struggles of the Filipino people. She also added the indispensable and vital role of the churches in accompanying the people in those critical times, and that the churches will remain faithful to its call, ushering justice especially to those who were deprived of it. 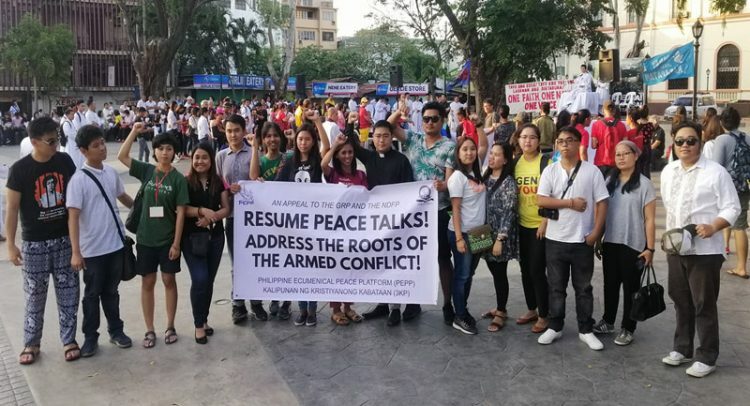 He also added that although the millenials have not experienced the horrors of the Martial Law years, the history of resistance and the collective memory of those who have come before have taught the youth an important lesson in history: and that is to not let history repeat itself, to learn from the lessons of the past, and to continue on defending and protecting the dignity of the people. “We will carry on the continuing struggle of our people as true democracy has not truly been attained,” he added. The rising culture of impunity is very much felt by the people even in this very times. The national spokesperson of the Student Christian Movement of the Philippines (SCMP) Kenji Murumatsu decried the day to day injustices that are happening in our society: from rising prices of basic commodities due to TRAIN law, the many anti-people policies of this government such as labor contractualization of our workers, to red tagging and persecution of our church leaders, bishops, lawyers, journalists, and human rights defenders, and to the killings targeting the poor in the guise of the so-called war on drugs. “Our society is replete with repression, the very same condition that thrived under the time of Jesus Christ, some two thousand years ago. As Christian youth, now more than ever, our prophetic call is to respond to these critical times, and be part of a movement, constantly challenging structures, for the sake of peace based on justice,” he said. The event was a visible expression of the growing solidarity of the people in the region. The Promotion of Church People’s Response-Panay and the Western Visayas Ecumenical Council were among the multisectoral organizers of this gathering.